Martorell, 20/09/2016. - Once again this year, SEAT will be the sponsor and official vehicle of the CSIO Barcelona 2016, a world-class riding event to be held from 22 to 25 September at Barcelona’s Royal Polo Club, an organisation to which the Spanish carmaker has remained committed for eight years now as institutional sponsor. This landmark sporting event is framed within the Barcelona Equestrian Challenge, one of the year’s most highly-awaited moments for riding enthusiasts, which puts the Catalan capital in the spotlight to showcase this sport. For the fourth consecutive year, the CSIO Barcelona is hosting the final of the world’s most prestigious national team riding competition. Added to this is the fact that the event organised by the Royal Polo Club has reached its 105th edition, making it by far the oldest international sporting event in Spain. According to SEAT Executive Committee President Luca De Meo “the Royal Polo Club is an excellent venue to highlight our brand and strengthen our ties with Barcelona and the city’s social environment. Likewise, the CSIO Barcelona is a competition that requires precision, quality and determination, and that is exactly how we work at SEAT”. For this edition, the CSIO Barcelona is staging a total of nine competitions with the foremost riders of the national equestrian programme. There will be six individual competitions, while the remaining three are included in the Nations Cup Final. This year, the sporting activity of the CSIO Barcelona will be complemented with an extensive events programme, featuring the “SEAT Evening”, an exclusive fiery percussion show for all spectators to enjoy after the competition on the evening of 23 September. This powerfully exciting artistic display, which has been especially prepared for the occasion, features a unique sensorial combination of music, colour, percussion and fire that will transport viewers into an urban world through the sound of powerful drums and melodies, which will set the pace of an unprecedented musical fireworks extravaganza. 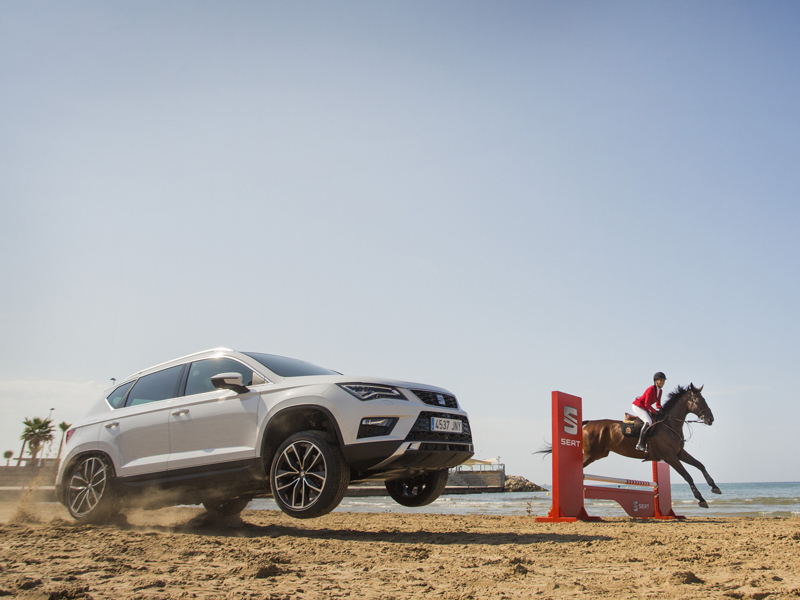 Likewise, the SEAT Ateca, the Spanish brand’s new compact SUV, will have an active presence at the CSIO Barcelona 2016, as not only will it be one of the vehicles used by the organisation to transfer participants and guests, but it will also be on display in Barcelona’s Royal Polo Club facilities, giving people the chance to take an up-close look at its design, spaciousness and technology.